I’ve been living and breathing the Origins art for a long stretch of time now, spending my spare time working and reworking the art, researching, and talking to people who can help me produce something special. I haven’t been keen to step away from the project until I see the deck hitting the press and heading out to the people who have given me such amazing feedback and support. So when Loop Cuts approached me and asked if I would be interested in working with them on a new accessory, I had to think about it. Very briefly. I’d seen the nice work they’d done on their original card clip, and this seemed a perfect opportunity to expand on the Origins world. Loop Cuts has also been very supportive so it’s nice to work in with them on something new and it gives me a chance to share something with my supporters while I head into the final stretch with the Origins artwork. I’ve taken inspiration for the Armatura artwork from 16th and 17th century woodcut renders of knights armour. The word armatura itself is latin for armour, and is still spoken in italian today. The line work I’ve refined for a clean modern take on the historic art. Designed with reference to the bordered art of ancient book covers, the work depicts shield like elements protecting the four pips of the deck, with a central compass making reference to movement and travel. 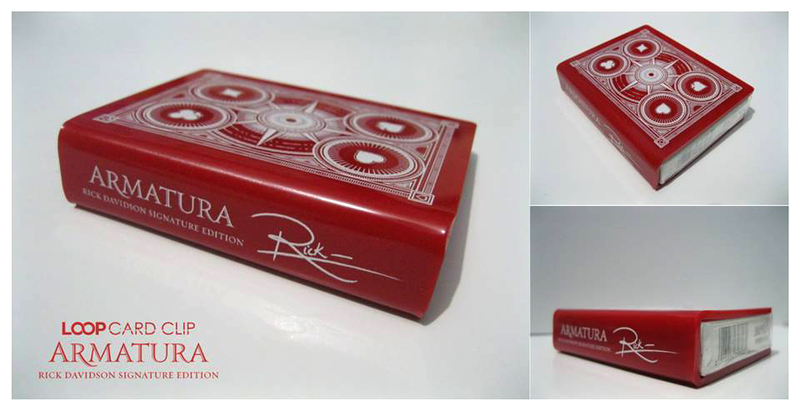 The result, Armatura – armour to protect your favourite deck when you’re on the move. I’m really pleased with the work the Loop Cuts team have done with the Armatura. I hope you like it too, and I’d like to thank you again for your support, it really keeps me going. If you would like to keep up with the developments on the clip, head across to the Facebook event page. I’d love to see you there.